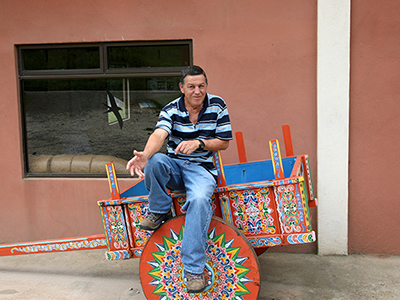 A man sits on a colorful Costa Rican cart. Completion of a minor in Latin American Studies satisfies the Miami Plan Thematic Sequence requirement. Latin American Studies minors do not need a Thematic Sequence. Students who are not LAS minors or majors may complete a Thematic Sequence by taking 9 semester hours outside of the department of their declared major. This Thematic Sequence gives students a broad understanding of the diverse histories and cultures of Latina/o populations living in the United States and emphasizes how Latina/o cultural politics in the United States are shaped in relation to both cultural formations within Latin American and racial/ethnic dynamics within the United States.. Courses are recommended to be taken in the order listed below; however, the courses may be taken in any order as long as 9 or more semester hours are completed. * Only one Foundation (MPF) course can count toward both a Foundation requirement and a Thematic Sequence.